Rihanna attends the ‘Ocean’s 8' UK Premiere on June 13, 2018 in London, England. I know, I know, it’s April Fool’s Day, but you’re the fool if you ever thought about taking food off Rihanna’s plate. Plus, this could clearly happen in real life, knowing Rih. The Anti singer was simply enjoying an oyster platter at London’s exclusive Chiltern Fire­house with her Saudi billionaire boo Hassan Jameel and friends when a drunken man walked by to swipe one of the molluscs, a source told The Sun. Oh, you done fucked up now, Mister. Rihanna went all out ordering platters and platters of oysters for her entourage. One lad, who was drunk, bowled over to her table and pinched one, thinking it would be hilarious. He passed it over to one of his mates, who was oblivious it came from Rihanna’s table. After downing it they carried on drinking only to be given a hefty telling off from one of Rihanna’s entourage, who demanded they pay £250 for a fresh platter because he had ruined theirs. The bloke who ate the oyster had no choice but to get his credit card out. 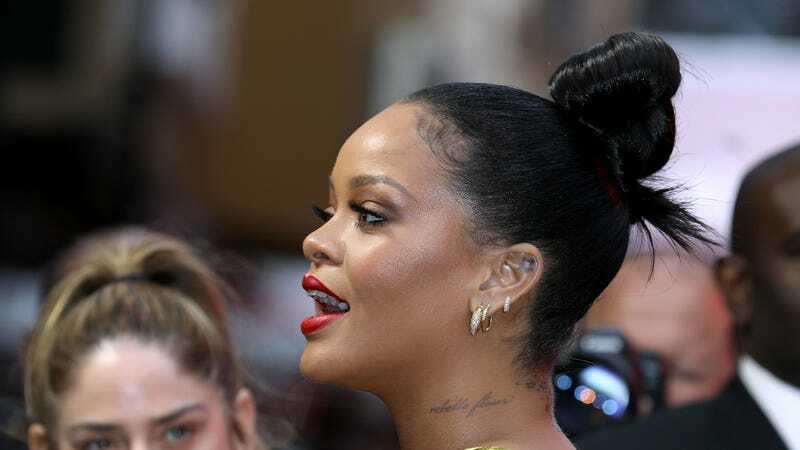 With all her millions, you wouldn’t expect Rihanna to notice a missing oyster but she’s obviously a savvy business-woman who surrounds herself with the right people to keep an eye on things. Look, keep your grubby hands off Rih’s oysters. Again, while I acknowledge this could totally happen and I’d be entirely here for it, The Root has reached out to Rihanna’s publicist team for comment.